Increasing prices of capital cities’ properties has encouraged owners of many residential and commercial properties to add value through refurbishment and extensions. As well going upwards, many owners are looking under their homes to add basements for more living space. To satisfy this growing demand, specialist contractors have emerged who have geared up to meet the challenges presented by sub-floor excavation. As well as being able to get equipment to the site, there is the need for removal of spoil, which may comprise concrete or hard rock. One of these contractors is Melbourne’s SLE Excavations. 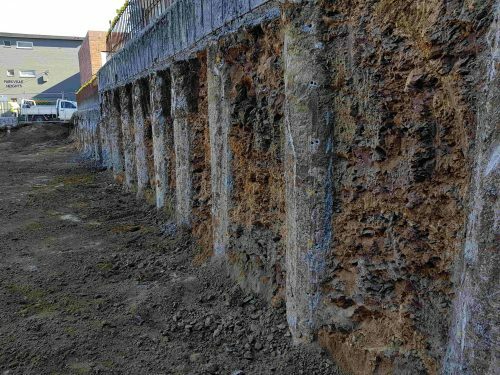 “There are times when it’s not desirable or practical to use a rock hammer for the removal of hard material ”, said SLE Excavation’s Shane Lindsay. “Apart from excessive noise, transmitted vibration can be an issue for adjoining residents and in meeting noise and vibration limits imposed by local councils. “These issues were solved when we purchased a Rokla model D10 Rockwheel. We have found this extremely powerful cutting unit to be robust, reliable and versatile. It enables us to significantly reduce noise when excavating rock in sensitive urban areas where even the operational hours of noise suppressed hammers may be restricted. “The D10 Rockwheel is lighter in weight than most other twin-headers on the market. We find it can deliver powerful performance, even when attached to a smaller excavators. We have noticed it has a high-torque hydraulic engine and picks are mounted on the drums at an angle that gives maximum power to penetrate tough material. “We have also found the design enables picks to grip strongly and hardly ever bounce, enabling the cutting heads to rotate at a speed that achieves outstanding excavation that ensures a clean profile,” Shane said. SLE Excavations specialises in large footprint and large-scale commercial/civil contracting. The business has completed many jobs in the civil sector, including large scale multi-level tight access basements, carparks, sporting facilities, commercial landscaping and both commercial and residential swimming pool excavation. Rokla attachments are available from Semco’s sales and service centres in Sydney, Melbourne, Newcastle and Queanbeyan, as well as Semco’s national dealer network. Further information call 1 800 685 525.